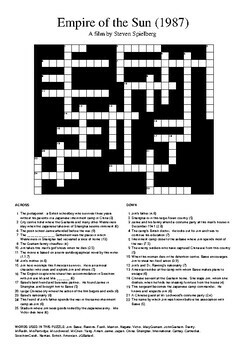 Crossword puzzle with word bank and solution based on the movie directed by Steven Spielberg. There are 28 clues. These are the names of all major and minor characters, and locations important in the film. 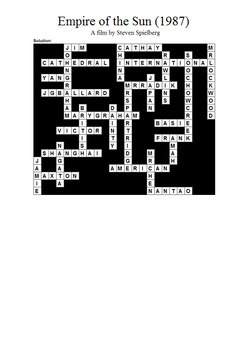 To see the words used in the puzzle, download the preview file. This is the solution grid. This resource/activity could be used as an in-class assignment or as homework, to help revise the text, or just for fun. It is a summary quiz, designed to be used after viewing the movie. It's an exercise that works well for group/pair work. Students seem to love the puzzle format, and many don't even see it as work. I've specifically written the clues to help students remember key facts about characters and places, by including a lot of detail. In this way, it's not just a time filler.. it's an active learning tool. A word bank is included to assist students. You could redact this to make the activity more challenging.